What’s our Mission? 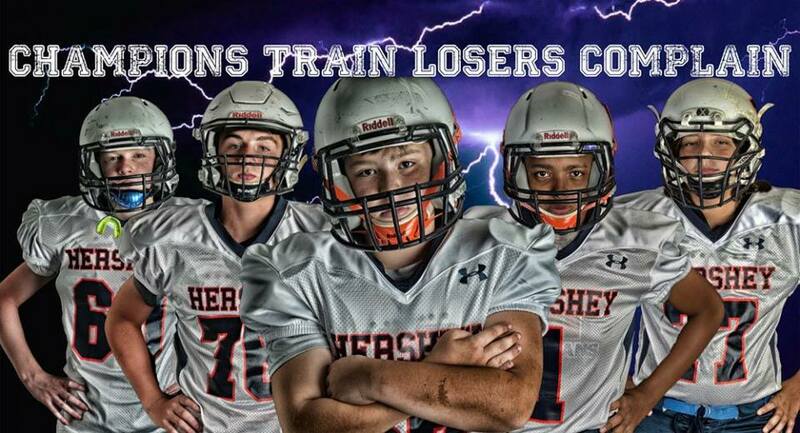 The purpose and mission of the Hershey Youth Football Association and Cheerleading (HYFA) is to establish and maintain a program of supervised tackle football and cheerleading for children. All HYFA members will keep in mind that the tackle football program and cheerleading program is operated for the benefit of children/students. Coaching staff at all levels will focus on the following fundamentals: positive character, mental and physical health and safety, sportsmanship, and higher performing student athletes. How is HYFA operated and managed? HYFA operates as an approved Section 501-c (3) non-profit organization of the IRS Code. “Members” of the HYFA community elect an 11-member Board of Directors (Board) at annual meetings in March. The Board are vested and empowered by the HYFA Constitution and By-Laws (drafted 2012, revised 2017) to manage all aspects of HYFA; to appoint committees, other officers or agents; or adopt rules and regulations as it may deem appropriate or desirable; to conduct the business of HYFA; without conflict of interest or personal gain. The HYFA Board holds at least monthly meetings during “off season” months, and as needed during the active season.All HYFA Board meetings are open to any HYFA Member in good standing, with times and location posted on the HYFA website in advance.HYFA Members can follow the activities and updates from Board meetings via “Meeting minutes” posted on the HYFA website. By authority of the HYFA Constitution and By-Laws (2017), HYFA holds oversight of all youth tackle football activities under the Rules and Regulations of Capital Football Association (CFA), (www.cfayfl.com). What are some things HYFA does to improve player Safety? Key safety initiatives have included: All HYFA coaches must complete mandatory background clearances in line with Pennsylvania Law (2013) and the Keep Kids Safe initiatives (KeepKidsSafe.pa.gov) for volunteers to include PA State Criminal Checks and Child abuse clearances (revised 2017). HYFA includes safety training to include concussion prevention and recognition, heat injury prevention and recognition as part of HYFA Coach orientation/clinics and enforces these through Board member, Athletic Director and Player Advocate supervision, and training participation by HYFA Board members. HYFA continues to monitor safety initiatives and enhancements from national resources, updates from the CFA and implements programs that are designed to increase player safety and well-being. Can my child participate in HYFA if we do not live in Derry Township? Yes, players are welcomed and encouraged to participate in HYFA if they live in a nearby community that does not offer youth tackle football or cheerleading programs. Any child who wishes to participate in HYFA for other reasons but their community does offer tackle football may need to secure a release waiver from that program to participate in HYFA. Where do I find important information about HYFA (registration, coaches, teams, practices, games, etc.) for each season? HYFA families can find all necessary information on the HYFA website (hersheyyouthfootball.website.siplay.com) or (http://www.hyfa.org); and on Facebook. Does HYFA offer financial assistance for families who might struggle to pay registration fees? Yes, HYFA offers player registration scholarships on a limited and exigent basis. In order to qualify for the HYFA Scholarship Program (player registration fees only*), the family/guardian must submit a confidential request to the HYFA Board of Directors in care of the HYFA Treasurer. (All requests will be reviewed confidentially by the HYFA Board Officers, including any past requests for assistance and limited income verification will be sought from family/guardian. If a registration scholarship is approved, the HYFA Secretary will inform the family/guardian directly.) *Special Note: A player(s) receiving a registration fee scholarship does NOT exempt his/her family from mandatory fundraising efforts per family or mandatory family participation in the volunteer duties at Home games. How can I get involved with HYFA? Beginning in mid-January with the HYFA Board planning for a new season, HYFA needs ongoing help to continue as an organization that offers the best experience possible to players and cheerleaders of all ages and skill levels. HYFA can’t possibly accomplish all that has to be done without the help of countless volunteers and community partners. There is a niche for everyone in the HYFA community and we can all support a huge workload that includes so much more than volunteering as a coach. From early pre-season through the end of yearly playoffs, we need ongoing help with countless tasks that include: field set-up and clean-up for all home games; team/parent reps, equipment and uniform distribution and collection; end-of-season celebrations; photographers who can take game-day photos then share these on the website and through Facebook; and so many other support opportunities not listed here. There are also mandatory requirements for ALL HYFA player or cheerleading families which includes fundraising activities and working different shifts at each home game in the concession stand, running the chains, gate/ticket sales, and set-up or clean-up. Regardless of your talents, HYFA needs and appreciates your help at any level each week and your kids will always be the true beneficiary of your efforts.Please contact any HYFA Board member to learn what else you can do to help, including running for election to serve on the HYFA board.